From yesterday's New York Times Magazine. LOL. And I hope, hope, hope I don't have to eat my words again. 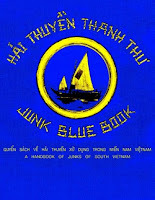 The home page is here: www.junkbluebook.com, and it now contains a working download link to the PDF document. Thanks for your patience, and thanks to my patient and charming web lady who corrected by multiple errors. Dear Readers: The Junk Blue Book website, announced in the previous post, promptly went down due to technical ineptitude on the part of yours truly. It's now back online, so please take a look if you'd like a free download of this valuable resource on the junks of southern Vietnam, circa early 1960s. My apologies for the inconvienience. But before you go feast your eyes, let me tell you what it is and how this came to be. 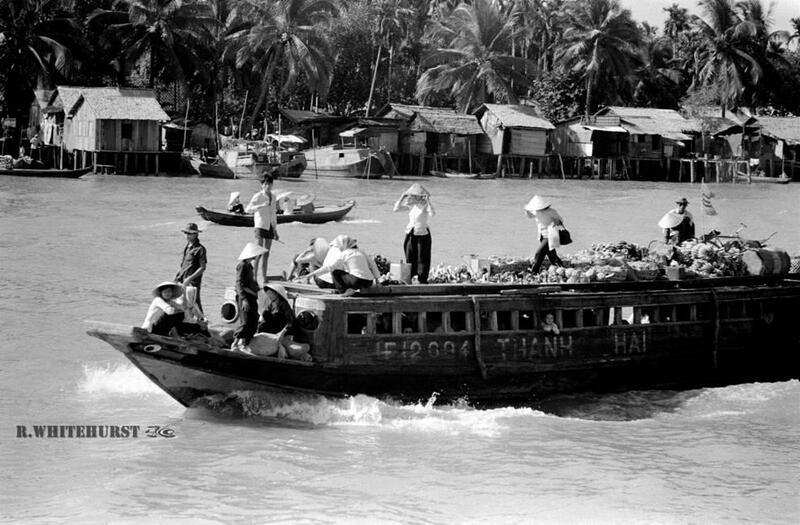 In the early 1960s, Colonel Marion Dalby of the U.S. Marines was assigned to survey the coastal craft of South Vietnam. U.S. and South Vietnamese forces needed a kind of "spotters guide," to distinguish presumably friendly local craft from those "visiting" from North Vietnam for the purpose of infiltration and smuggling. A sailor who obviously had a strong appreciation for the culture in which he was working, Dalby took to his assignment with gusto. 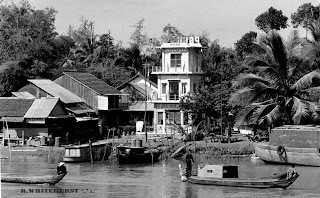 He collected far more information than was needed for the purposes of mere identification, and created instead a comprehensive description the junks of the country, including their construction, their use, and even ethnographic information. 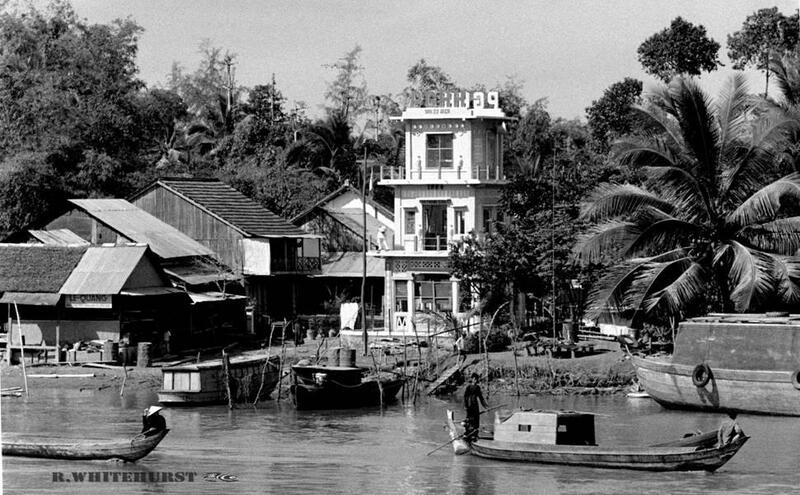 The work was printed in 1962 under the title Junk Blue Book by the U.S. government in a dual English-Vietnamese edition. The press run was very limited. Capt. 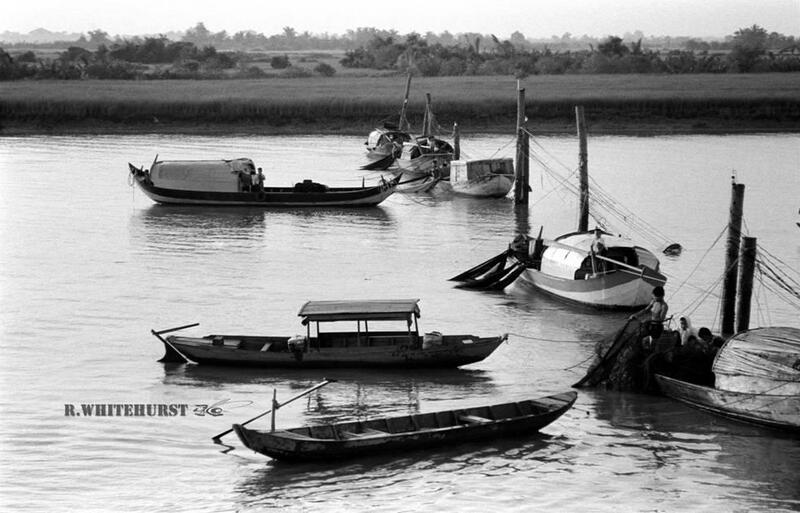 Robert Whitehurst, whose photos of Vietnamese junks appear in the previous post, served in Vietnam in the early 1970s, and it seems that he too contracted a jones for junks while he was there. Long after returning to the States, he had to look long and hard to find a copy of the Junk Blue Book. Appreciating both its rarity and its importance, he wanted to make it available to others. 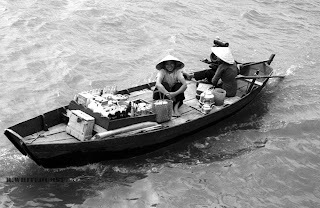 After cleaning up a complete set of scans of the book, sharpening images and otherwise improving them, he contacted me and we soon came to an agreement for Indigenous Boats to place the document online for free download. 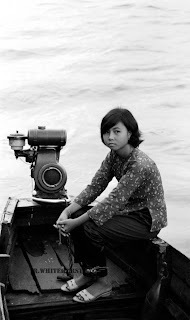 To that end, Indigenous Boats has created a new static website, The Junk Blue Book of 1962, with a download link for the book itself. I am greatly appreciative of Capt. 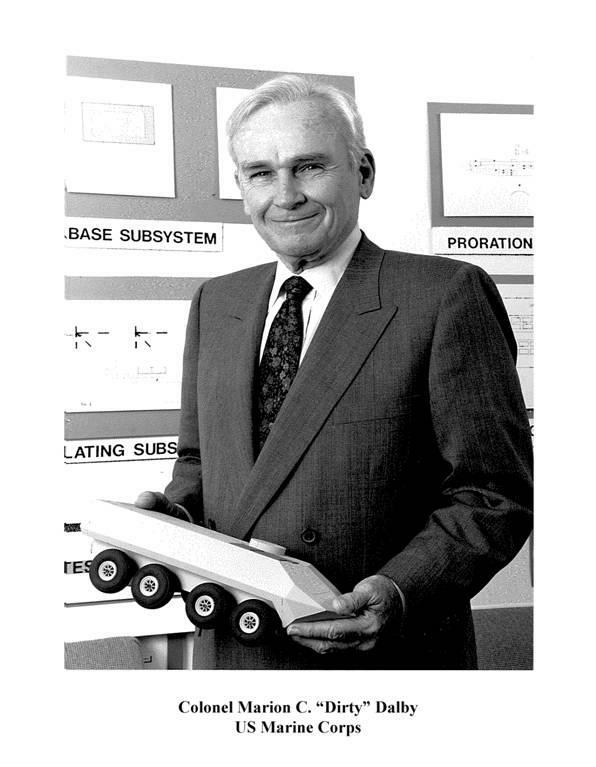 Whitehurst for making the document available, and we both hope you enjoy it. A Hoa Hao Buddhist minaret. There were over 800 of these in the Mekong Delta in 1975. Most are gone today. 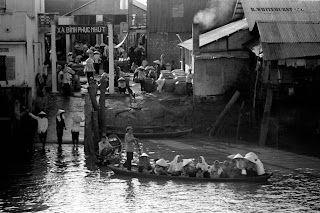 Market at Binh Phuc-Nhut Village on Kinh Cho Gao canal. For more (there are 199 in all, though not all are boat shots), see Rob's Facebook album. Many thanks for permission to reuse these wonderful photos here. Please note that permission for further reuse is not granted or implied. Once again, friend and fellow jangada fan Silvio Antunha has steered me to some great material about jangadas, the Brazilian sailing raft which evolved into a plank-built hull of similar form. 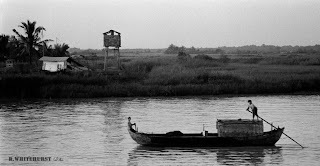 Non-Portuguese speakers will only be able to appreciate the images in this first video, "The Last Jangada Man," but Silvio tells me that Master Eremilson, the eponymous jangadeiro, travelled 4,000 km. along the coast of Brazil on a jangada in 1972. 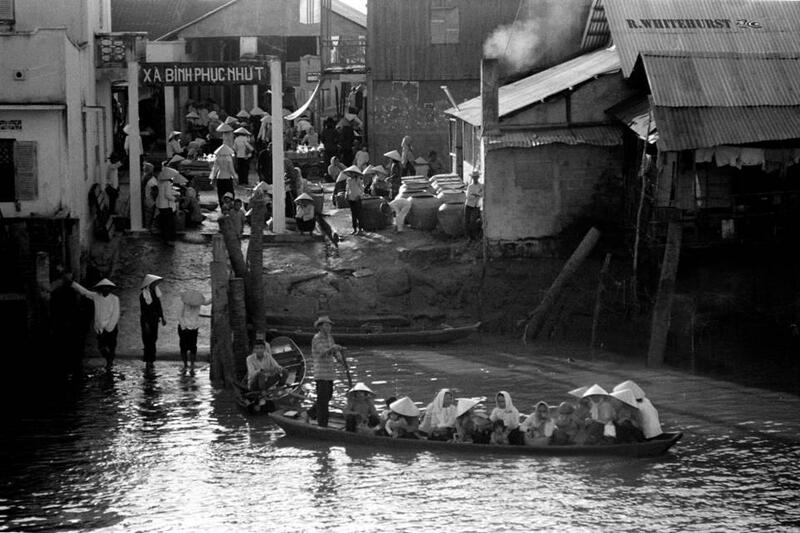 There are extended segments where he speaks to the camera, but in between are a few segments showing the boat in its modern form, and several old black and white clips showing the earlier raft form. At about 7:30, there's a great clip of a bunch of the sailors taking one over the surf like a big sailboard. While you're there on YouTube, search for "jangada" -- there's a surprising number of videos about them. Then for good measure, look what you get when you search the term for images in in the Portuguese version of Google. Dozens of lovely shots! This one cracks me up: a putative jangada made of empty pop bottles. The photo was taken by a Peace Corps worker in Brazil. Source is here. 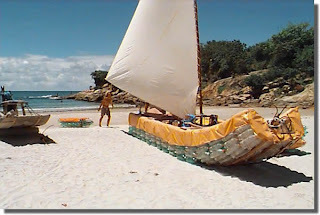 Here's a video (a slide show, really) with lots of good images of the Brazilian fishing craft known as a jangada. The soundtrack is a jangada fisherman's song. Most of the jangadas shown are of the more modern plank-built buoyancy-hull type, but there appear to be a couple of the log-raft variety. I find the mast, with its adjustable foot and severe curve, to be among the more interesting features of this type. We've looked at jangadas in several previous posts. For more, see here. Thanks to Brazilian friend/reader Silvio Antunha for this one. 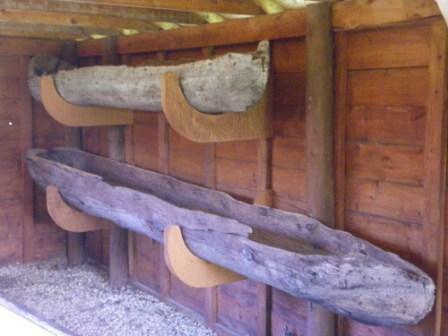 while interned at the camp the PoWs built several Dugout canoes. They would use them to paddle around Whitewater Lake. 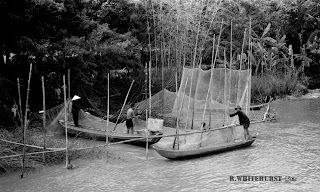 The canoes ranged in both size (1 & 2 men) and propulsion method ( Paddle and Sail). A team of achaeologists is investigating the site, and they've recovered at least two of the canoes which, as shown above, seem to have been quite nicely made. More photos here. It seems odd that prisoners of war were allowed both the tools to construct canoes, and the freedom to use them. It would be interesting to know more about the security considerations under which this was possible.